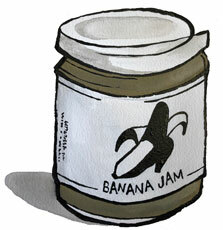 Banana Jam for sale. Buy online at Zingerman's Mail Order. Gourmet Gifts. Food Gifts. I was going to write something clever about how Elvis Presley would have loved this jam for his famous peanut butter and banana sandwiches, but that seems a little played out. But he would have, totally. There’s not much else in this craveable jam besides bananas, sugar and organic vanilla beans. It tastes like spreadable banana bread. It’s thick, spoonable stuff that will have banana lovers slathering it over everything from morning toast to gelato banana splits. And peanut butter sandwiches, naturally.